Steelhead fishing has been pretty good lately with some nice-sized chrome fish coming boatside. Anglers finding the most success have been using cured salmon eggs tied into spawn bags. With all of the recent rains, larger bags have been the key to getting steelhead to bite. Spawn fished under a float, or back bounced through deep holes and the tailout runs have been the most consistent. Anglers fishing near Tippy Dam have seen the best action on the lower stretches of the Manistee River. Along with the steelhead bite, lots of trout are still being caught. Anglers are still catching fish on beads pegged a couple of inches above the hook, so those that don’t want to mess with spawn are still getting bites. This has been the best option for fly anglers. Those that are inclined to use spawn are seeing slightly better fishing, as the added attraction of scent tips the odds in their favor. Colder water temperatures have fish holding a little deeper and less willing to travel to take offerings. This is where spawn or small steelhead jigs tipped with wax worms have been paying off–both for steelhead, and for the resident brown and rainbow trout. Float fishing behind spawning gravel has been the best option, although bottom bouncing has produced good results as well. Lots of rain, and even quite a bit of snow, lately has water levels higher than normal, which means that caution should be taken when venturing out. Anglers wading near Tippy Dam should take extra precaution as there can be slippery conditions with the snow. Water temperatures were 41-42 degrees right up at the dam. The Betsie River near Frankfort has had some nice steelhead come into the system with the recent rains and snow. While there haven’t been a ton of fish in the system to target, the fish that are there are big. Covering lots of water has been key to locating them. A recent trip saw fish over 12 pounds come to net, with a couple of other bites from what appeared to be large fish. The best options right now are below Homestead Dam. Lake run brown trout should be coming into the river system any day now. Spawn bags that are larger than normal have been the ticket to getting bites, as the water is off-colored due to the rain and snow. In fact, the water is high enough that getting under the bridges in a boat has been impossible. 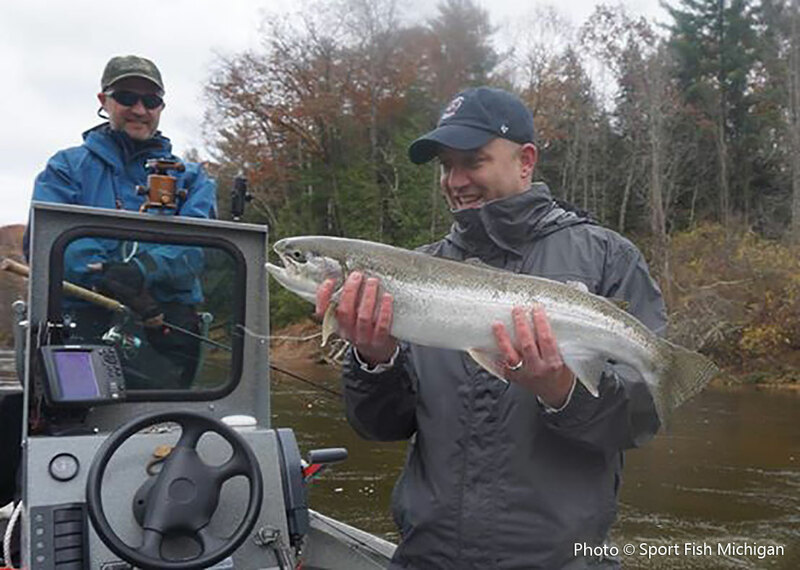 Hook N’ Look’s Kim Stricker is enjoying a nice fall day on the water with Capt. Ben on Platte Bay in the Sleeping Bear Dunes National Lakeshore. Trolling in Frankfort when the weather has allowed has been pretty good for 2 and 3 year old king salmon, steelhead and the occasional brown trout. The cold water has fish feeding heavily when the winds are down. Steelhead are in the top portion of the water column, and can be targeted just a few feet down with body baits and flashy spoons with gold or orange. Salmon can be trolled quickly this time of year, with a slightly faster speed often producing quality bites. 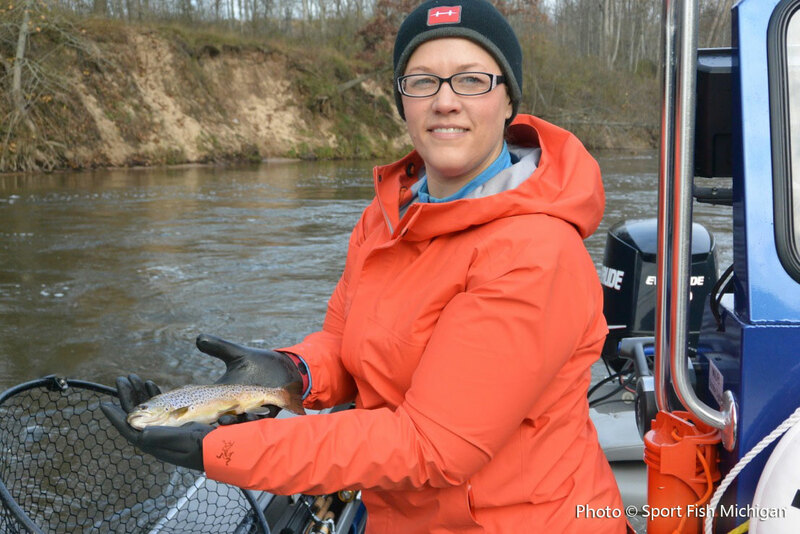 Mae with one of the many trout she landed while fishing with Wolfe Outfitters on the Manistee River. Salmon season is over, aside from a few holdover fish on gravel. Steelhead is the name of the game now, but there aren’t tons of steelies in the Manistee just yet. While there are definitely some fish in the river, fishing hasn’t been gangbusters as hoped. Trips are yielding a few bites per outing, but action has been bolstered by a great trout bite when fishing close to Tippy Dam. Fishing with spawn bags or beads under a float has been the best option lately. Fly anglers fishing egg patterns and beads under a float have also seen action. Hopefully the recent snow and windy weather will trigger another push of fish, giving anglers more great days on the water. Steelhead are in the Betsie, and fish are running large when they can be found. Fishing above Kurick road is closed now for the closed trout season, but there are plenty of steelhead opportunities below Kurick. Float fishing with beads has been producing in the slower water just below gravel areas. Recent higher waters have given the river some stain, and brighter flies or beads can be key. The hard north winds and rain/snow mix should bring fresh chromers into the river. Steelhead are in the rivers, and the action is heating up! Not bad for John’s first-ever steelhead caught while fishing with Jeff Mallory and Wolfe Outfitters! Great job! The fall bass bite is on, and some of the best fishing can be when it’s nasty out. Traditionally, snow or sleet squalls can produce a red hot bite, helping to keep anglers warm during what is otherwise a chilly time of year. Fast moving baits like lipless crankbaits can trigger reaction bites from big bronzebacks and largemouths. Deep diving crank baits can also produce well when fished around isolated cover, and underwater points or humps. Some of the biggest bass of the year come now, and as the inland lakes cool more quickly than the bigger water of the Grand Traverse Bays, action has been dynamite when the wind and weather allows anglers to get out. When fish aren’t willing to chase down fast moving baits, crawling a tube or a drop shot rig can pay off handsomely. Blade baits will come into play as water temps drop into the upper to mid 40’s. 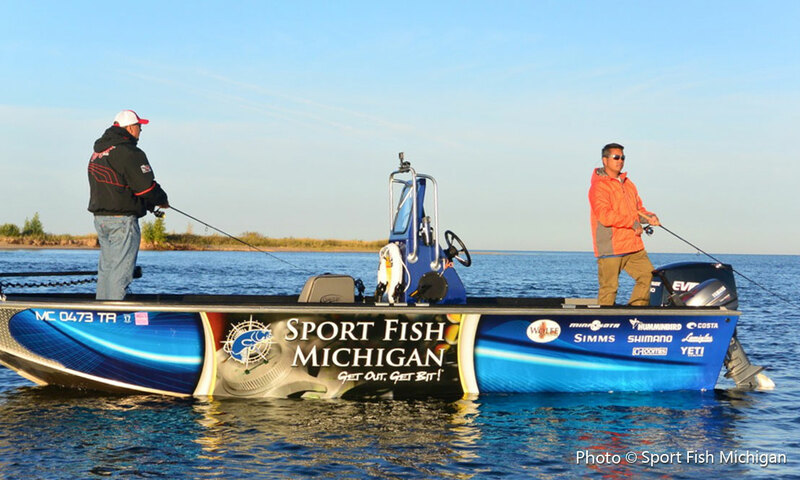 Care should always be taken when heading out onto the water this time of year, but when the weather cooperates, the fish usually do as well.